If you choose to remove your canopy for the winter, there is no doubt seeing the wear and tear of another season’s use can be disappointing. We all like to buy nice things, and especially for outdoor products, it can be shocking how quickly exposure to weather has an impact on the appearance of newness. Not to worry. Most quality materials designed for long term outdoor exposure can be brought back to nearly new with a simple cleaning. 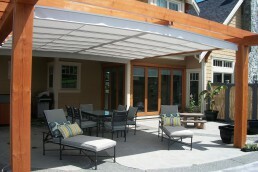 Quality materials like Sunbrella commercial awning fabrics are well known for their resistance to fading and staining. However, they are not resistant to getting dirty. So let’s talk about how to deal with dirt and other consequences of exposure to the outdoors. We’ll also talk about the consequences of color choice. Like a car, regular washing keeps it looking new longer. For awning fabrics, a monthly hosing off with clear water is the equivalent of a car wash for a car. Regular hosing off makes the annual cleaning more effective because you don’t have to scrub through months of ’embedded’ dirt. If your canopy is seeing the simple day to day dirt that is called airborne debris, then the you can find cleaning instructions on our care and maintenance page. Canopies exposed to the detritus of trees can benefit from a more regular hosing off. If you have pollen, leaves, and pine needles, you’ll be surprised how often light wind action will blow this off, but you shouldn’t take that for granted. If materials are accumulating, you are best to hose them off. Stickier stuff like sap or bird droppings needs special attention. For that Sunbrella provides a stain chart with specific instructions for the different stains your canopy could suffer. The color you select will have a big impact on how clean your canopy will appear. We always warn customers to avoid white and other ultra-light fabrics because regardless of how clean they are, as dirt accumulates it shows quicker and more prominently. Finally, mildew is an issue that can accompany installations that are in the shade in moist climates or under trees. The Sunbrella fabrics are mildew resistant. However that does not mean they won’t mildew. It means that mildew will not damage the fabric. To clean mildew, refer to Sunbrella’s mildew cleaning instructions. Enjoying the finer things in life is a special treat. I hope this information helps you to keep your nice things nice. With ShadeFX your investment in lifestyle was made to last.